I just can't resist this. I watched "I DO", Times Two! when they aired it on GMA 7 and it was really amazing. 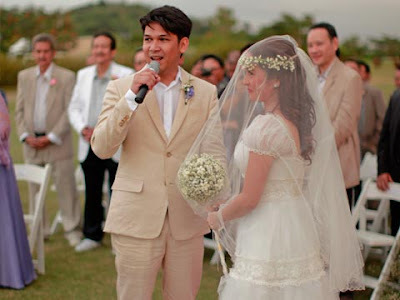 Jolina Magdangal and Mark Escueta first got married last November 19 in the presence of their closest friends and family. 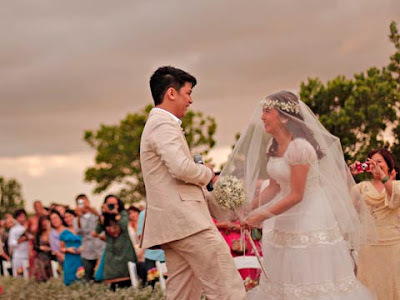 Their garden wedding took place in Tagaytay 2 days after. This lovely couples took very sweet photos, so I just wanna share my thoughts about it. Playing hippies. Jolina's leopard booties look awesome. Perfect pre-nuptial photo. I like their theme a lot. 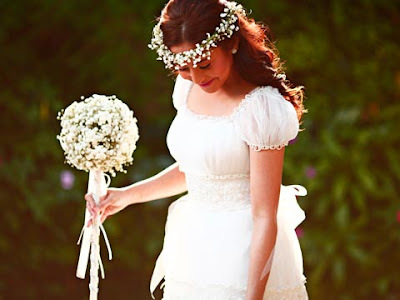 Have you ever seen a fairy bride? 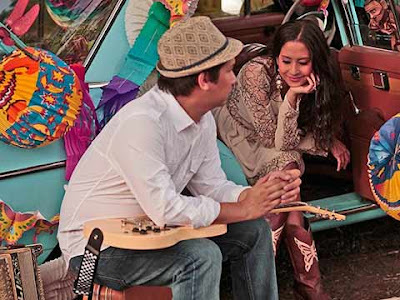 The Magdangals. 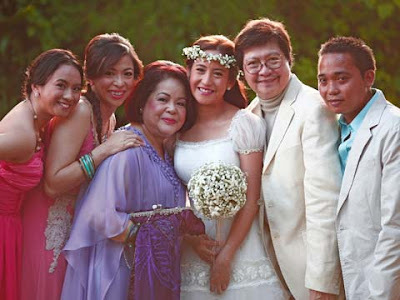 Jolina resembles her dad. 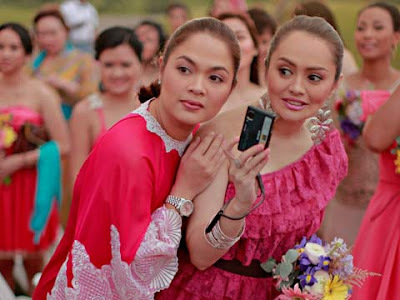 Judy Ann Santos and Angelika dela Cruz among the guests. Now, this is what we call true love. I can see happiness within this couple. Great pics!They look very in love! Love the pics! Did you have to edit them or were they published as is? So hippie-fairy! Very laid back. :) Btw, Jolina is also nice to her fans, something I like about her. wow! I missed to watch this on GMA. What a sweet couple and the bride is very lovely. I love the theme. @Alina: These pics are not mine. Hihi. @Janine: Really? I saw Jolina in person and yeah, she's very sweet to her fans. @Steffie: I did not edit po. As is yan. @Jelena: I know. Really romantic and cute! @Nuts: Same here sis. Muah! ang ganda ni jolina!! nde tumatanda! and ang ganda ng theme nga!! lovely!! so yan pla nakatuluyan nya ;D ehhehehe sinu kumuha ng photos n to?